I got the 02 Palette which is a lighter version from the 01, which had a black and dark brown powder on it. I got the 02 because I've seen several makeup artists of The Body Shop Philippines, use the darker shade of brown in the 02 palette on me. I know that the darker shade is intended as a liner while the lighter one as the brow color but since the darker shade matches my brows better, I bought this instead. Brows are such an important part of the makeup look especially if you have sparse or bushy eyebrows. Brows frame the face and with the right definition, you can give yourself a makeover just for grooming your brows. To date, I think I have 5 brow products in my stash. Having really unruly and bushy eyebrows then having it groomed made me realize how different and so much better looking I am when my brows aren't all over the place. Pluck the stray hairs around the eye lid area. 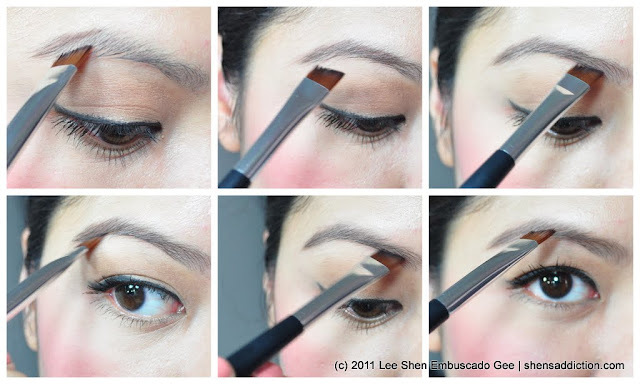 Start filing in your brows from the arch instead of the edge of the brows. 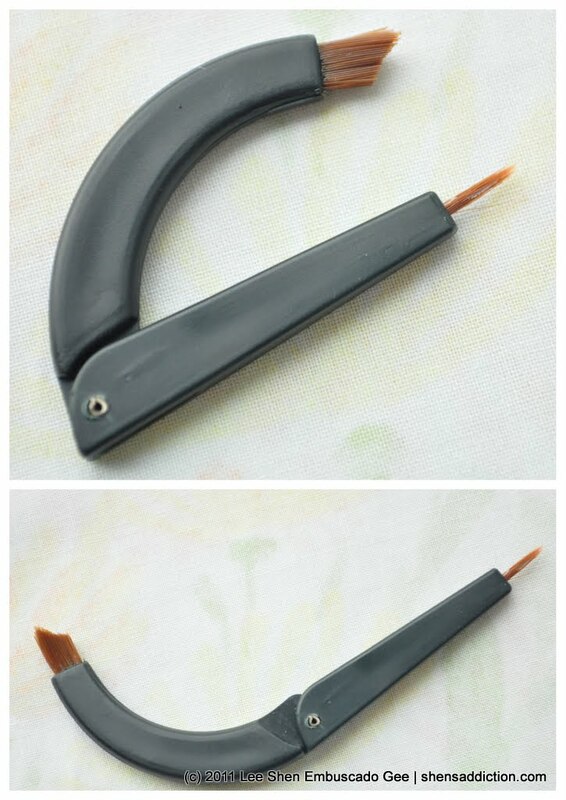 Use the darker shade of the kit to define your eyebrows. Fill in your brows with the lighter shade of shadow on the kit. The shades with wax are very pigmented which makes using this kit a lot easier. The shade lasts all day even with changing temperatures of the weather. The packaging of the palette is so nice! Really shapes the brow and keeps it in place. How natural my brows look even if I pile on the product and create a really incredibly defined look. they can do away with the brush included in this kit. For me it's a bit awkward to use. Better use a slanted liner brush. I like Charm's Duo Brow Brush. I really don't regret getting The Body Shop Brow and Liner Kit in 02. It matches my brows perfectly and achieving a well-defined brows is a breeze. I have a quite a collection of favorite eyebrow products, The Body Shop Brow and Liner Kit is definitely on the top three. Worth the money, indeed! And definitely high on my recommendation list. I can even say that this has replaced my HG Eyebrow Palette, ModelCo Eye Browz Designer Kit. Want to be able to groom your brows on your own? Visit a brow place like Browhaus and get your brows threaded by them. So far they have the most accurate way of giving you a really natural looking brows. Once you've seen how your brows should look like (sans stray hair etc.) practice filling it in, day and night. Soon, you'll be able to do your brows on your own since you've sort of memorize how it is shaped and where hairs should actually be. The Body Shop Brow and Liner Kit is available at all The Body Shop Store. I got mine at SM Hypermart. Browhaus is located Serendra and Greenbelt 5.
this looks like an interesting find sis. i use to prefer powder brow shaders but i've recently used pencil and found them creamier. hmn. but i'll have this in mind to check out earlier. thanks sis! and oh, love the arch of your brows!